How much longer will my roof last or when does it need to be replaced? Ultimately, this comes down to cost. At some point, a roof will require multiple repairs. The costs of these repairs add up over time and can eventually be more than the new roof would have cost. The best way to make this decision is with a periodic inspection which provides you with an estimated cost of repairs to compare against replacement cost. The condition of the roof has to also be considered. Shingles get brittle and can’t easily be replaced. Some shingles aren’t made anymore. Builtup gravel roofs start to split and merely working on the roof can cause more splits. When possible, view the roof with your roofer to completely understand the condition. Which felt is right for my house, #15 or #30? #15 is good for most houses and you won’t likely see the benefit of increasing to #30. We use #30 on steep slope roofs because when the installers are standing on the #15, it will tear causing potential injury. The #30 is sturdier and doesn’t tear under the installer’s feet. For most applications, #15 should be used. Why is my roof still leaking when multiple roofers have tried to stop it? Roofers tend to look at the roof first and fix roof items. Leaks can be from many other items such as AC, walls, floors, plumbing and condensation. Finding a leak can be a process of elimination. When calling a new roofer in to look an ongoing leak, show all the previous work so the process doesn’t start back at the beginning. Then qualify the experience of the person coming to inspect gives the best chance of finding it. Why can’t a roofer come out today in the rain to fix my roof leak? The best answer is safety concerns. Rain causes slip hazards and potential lightning strikes. As a safety concern, it is better for workers to not be climbing ladders or standing on a building during the rain. We get lots of calls during the rain. Most are minimal and don’t cause damage to property. We can come out in the rain, however, most materials used to repair leaks do not stick in wet weather. For this reason, it is better to address the leak shortly after the rain stops. We do have an emergency service if the leak is severe and causing damage. In this case, call and we will come to help you. When it comes to your building, the type of roof to install is not an easy answer. Some companies are one-size-fits-all, meaning they do one type of roof system and will put it on any building. The truth is, there are many factors to determine the right roof for every building. A wide-open roof or a congested one with units and pipes make a difference. Also deck type, access, building height and usage all affect the decision. Then you must make the decision whether to overlay the roof or tear it off and replace from the deck. The decision to overlay requires an inspection to determine the number of roofs and whether the insulation is wet. If a tear-off is chosen, then possible upgrades may be required to meet current city code. The best way to answer this question is to call Zenith for a free inspection. Why can’t you fix my leak the first time? A leak in a building can be a complex issue. Due to deck types, multiple roofs and a variety of other causes, the actual leak entry point can be several feet or yards away from where it drips in the building. Owners generally want the least cost to the initial repair. This results in a quick check and spot repair of common causes. This does repair most leaks, but then there are the occasional odd leaks that require multiple technicians and sometimes multiple companies to find and eventually fix. 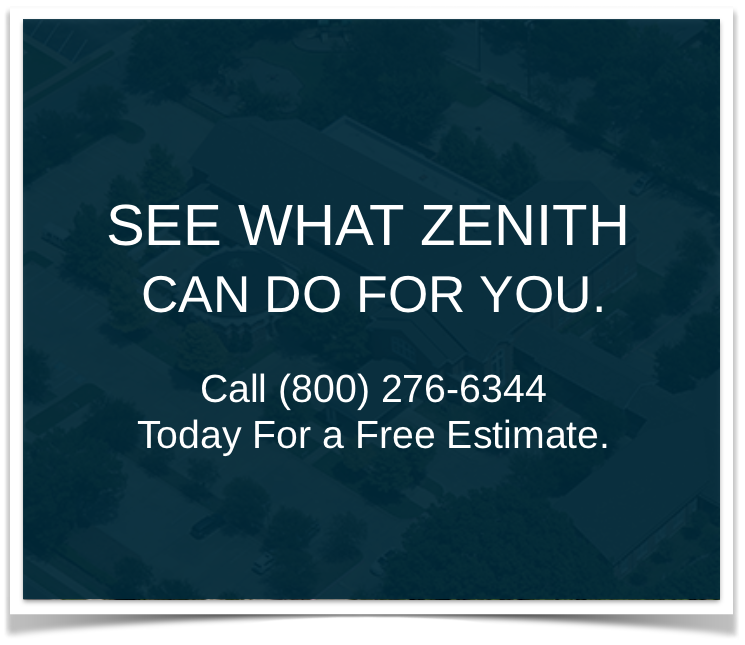 Zenith understands the history and common methods used to repair leaks. We consider all possible causes when analyzing a leak location. Technicians undergo regular training and meetings to discuss recent leak discoveries and causes.